Is there a new sign on top of Uhuru Peak? Sorta. It's a quick story, but thought I'd take a blog post to explain it since you've probably seen people with the original sign, then a new sign and then what appears to be the old sign again. It was always more than just a sign. When you reach Stella Point (18,652ft) every ounce of your body is searching for energy, searching for the will to keep going. Even though you will be aware of the fact that you've climbed all through the night, across a gradient so steep and full of scree that every step forward only caused you to slip a few steps back, the thought "I've come far enough, maybe it's okay to turn around" will at some point cross your mind. From Stella Point they'll tell you to keep going, they'll tell you it's only 45 more minutes to Uhuru Peak, they'll tell you that you can do it, that you're so close. If choose to keep walking, then in the distance, what once was a dream you had hoped for suddenly becomes within the reach...a rustic and wooden set of planks marking the highest point in all of Africa, Uhuru Peak at 19,340 ft. If you've ever done any research on a Kilimanjaro trek or even a quick search, the old wooden sign, weathered thru the years and the mark of achievement for so many trekkers, is likely one of the first images that'll come up. Adorned with stickers from trekkers of the past, seeing the iconic symbol in the distance is sometimes the only motivation left to keeping going. I was told by my guide that the old sign was likely carried up Kilimanjaro on the back of a porter many years ago. I summited Kilimanjaro in October of 2011 via the Machame Route and had my photo taken in front of the old sign (with a faint but visible smile). I was a bit baffled when friends returned just a few months later with a photo of themselves at Uhuru Peak, next to what appeared to be a plastic neon green sign. 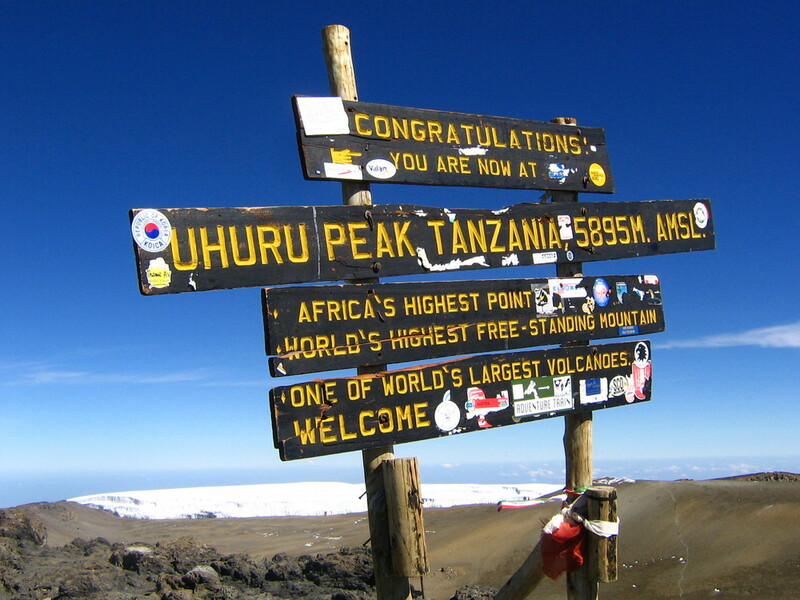 Well it turns out that in early 2012, the old sign had been retired, and a new sign had been erected at Uhuru Peak. The unveiling of the new sign also coincided with Tanzania celebrating 50 years of independence from Britain, and being renamed from Tanganyika to The United Republic of Tanzania. As well intentioned as it was, no one liked the new sign. The glare of the sun rays often made it difficult to read what the sign said, and well the colors just didn't seem right. Everyone missed the old sign and everyone (rightly so) made some noise about it. The noise was heard by the Kilimanjaro Park Authority and in the summer of 2014, climbers reaching Uhuru Peak must have felt like they were experiencing <someone else's> de ja vu, because the old sign was back! Well to be precise it was not exactly the old sign, but definitely a replica of it, with the same look and feel, oh and a slight modification to the text written on it. So for those of you planning a trip to Kilimanjaro, you now get to look forward to having your picture taken with the iconic new "old" sign! Reaching Uhuru Peak will be nothing short of a challenge, but just like so many things in life, don't give up before you turn the corner. Because when you do turn that corner, you'll see the sign in the distance, calling to you and you'll have no choice, but to keeping going.